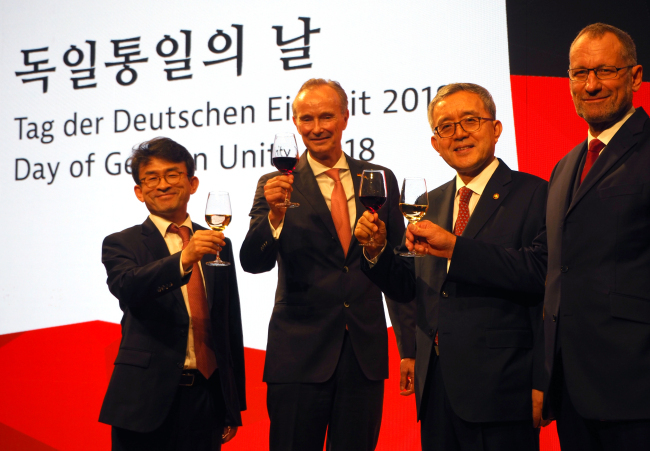 “As a reunited country celebrating the 28th anniversary of unification, Germany is looking with a particular interest to the Korean Peninsula. People in Germany feel for Koreans. We see Korea as an important value-based partner in our ‘alliance for multilateralism.’” Ambassador Stephan Auer said at a reception marking the Day of German Unity on Friday in Seoul. Oct. 3 is the Day of German Unity -- a national day that celebrates the anniversary of German reunification in 1990, when the goal of bringing together a Germany split as a result of World War II was realized. The day -- when the nation’s reunification was formally completed with the disestablishment of the German Democratic Republic (East Germany) and its absorption into the Federal Republic of Germany -- has been celebrated since 1990. The ambassador stressed that the two nations combat climate change and environmental pollution together, adding their alliance for multilateralism needs strong teammates to secure lasting peace and prosperity around the globe. 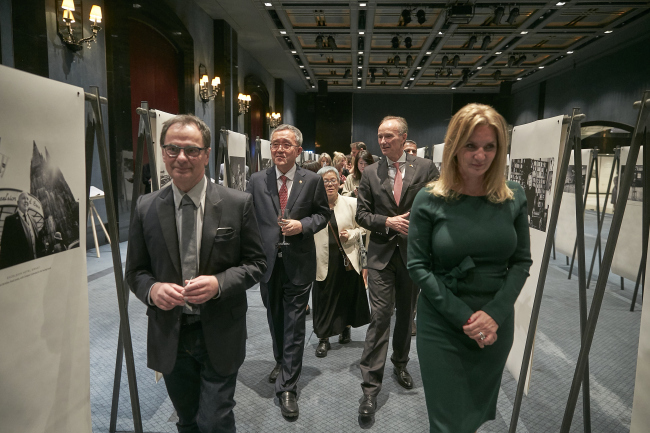 At the reception the photography exhibition “German Contemporary Excellence,” by Gerhard Steidl and the Meisterkreis, was held, showcasing images that illuminate diverse aspects of success in a reunified, present-day Germany. The pictures stimulate discussions about the complementarity of the German and Korean economies as well as their cultures, arts and technologies, according to the diplomat. The Ministry of Personnel Management is operating a training course for its high-level public officials at the Free University of Berlin. Using Germany’s experiences and expertise, it is also conducting research on providing prospective capacity-building programs for North Korean officials for future inter-Korean exchanges. “Germany’s experience of reunification is a precious lesson for us. Despite issues unique to each country, the Eastern Policy, gradual expansion of exchanges between East and West Germany, mitigation of social conflicts and economic challenges caused by reunification and other historical experiences inspire all Koreans,” said Kim.